There is no doubt that PicMonkey is a great tool to edit photos online. 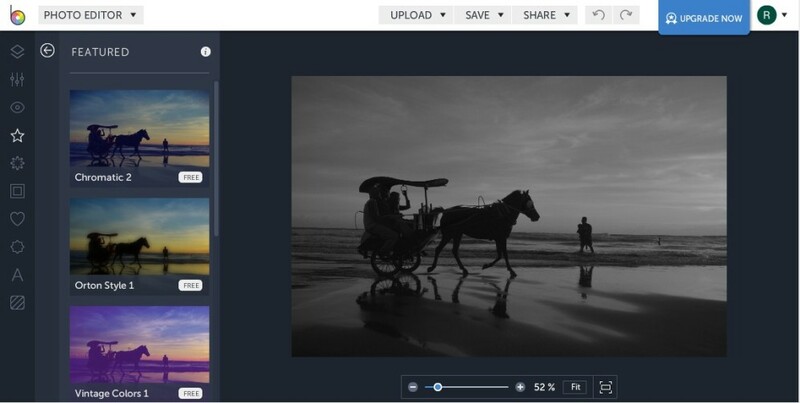 It is a great tool especially for new photography hobbyists who have no good photo editing skill since learning to use tools like Lightroom and Photoshop can takes some time. PicMonkey allows you to effortlessly make adjustments to the photos you took to get the best tones, as well as adding some effects. The problem is, PicMonkey doesn’t offer a free version, which is not a good news particularly if you are just a photography hobbyist who take photos for fun. 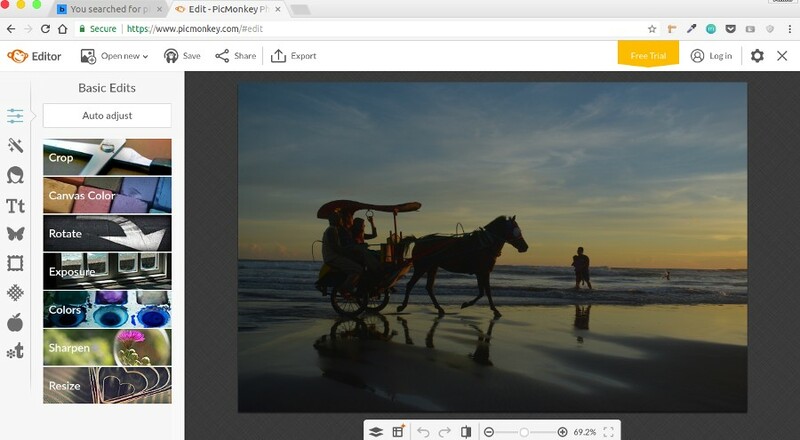 Don’t worry, PicMonkey is not the only online photo editor available, there are a bunch of other alternatives you can use. Following is the list of PicMonkey alternatives you can use for free. The first tool you can use to replace PicMonkey is FotoJet. Same as PicMonkey, FotoJet doesn’t only provide photo editor. It also provides collage maker and also design tool. The photo editor provided by this tool has the similar interface as PicMonkey whereby there is a side panel you can use to access the menus. The FotoJet photo editor is great if you want to add such effects as sepia, black and white, vintage, and so on. 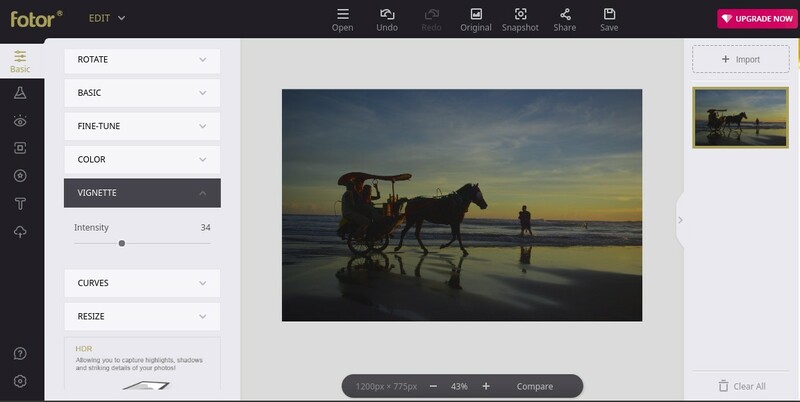 FotoJet allows you to open photos from both computer and Facebook. It’s a freemium tool. Some effects require you to become a premium user to be applied. Fotor also doesn’t exclusively provide a photo editor. Instead, there are three tools offered by Fotor: collage maker, design tool and photo editor. The photo editor of Fotor also comes with a similar interface to PicMonkey with a panel on the left side to allow accessing the available menus. Fotor comes with richer features than FotoJet. In addition to effects — which are put together under the “Effect” menu — you can also make basic editing like fixing the exposure, cropping the image, resizing and so on. Fotor is also a freemium tool. You can use it for free, but you have to deal with ads when working. 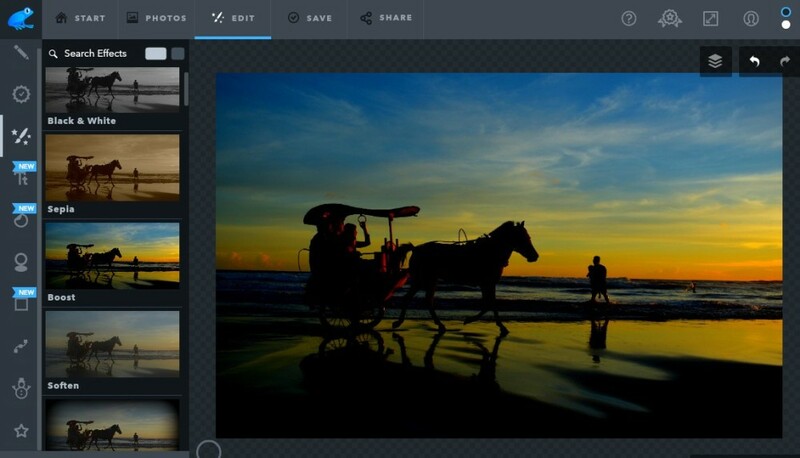 Fotor allows you to upload photo you want to edit from computer, Dropbox, Facebook and Fotor Cloud. Canva is better known as an online design tool alternative to InDesign. Apparently, it also has an online photo editor which you can use to add effects, adjusting brightness, saturation and contrast. It also has menus to allow you cropping image as well resizing. 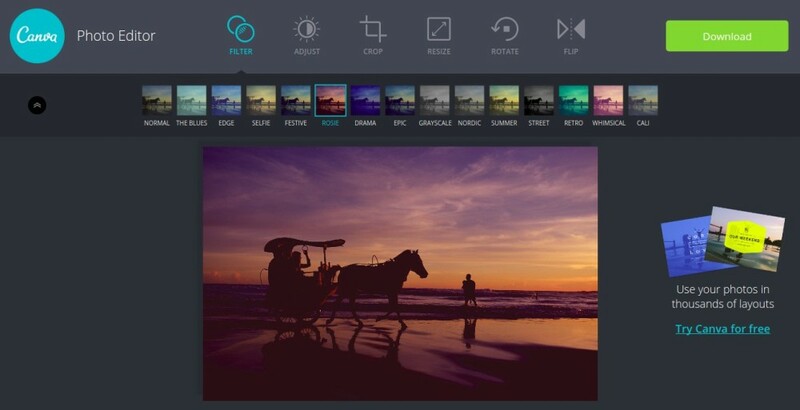 The interface of Canva Photo Editor is simpler than two tools above. There is no panel on neither left nor right side. The menus lie on the top, above the canvas. 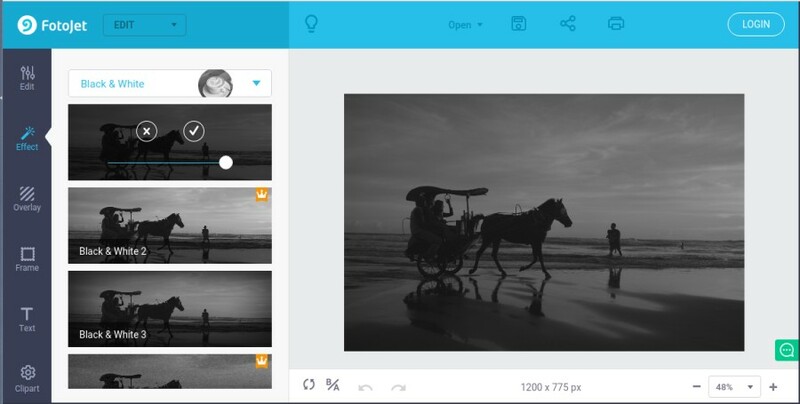 Canva Photo Editor is fully free to use with no login required. There are three tools offered by BeFunky: collage maker, design tool and photo editor. The photo editor of BeFunky has the similar interface to two first tools above, with a left panel to access the available menus. The features offered by BeFunky photo editor are rich enough. You can make adjustments like setting the exposure and saturation. Basic editing like cropping and resizing image can also be done in this tool. There are also a bunch of affects you can apply. BeFunky allows you to upload photos from computer, Google Drive, Dropbox and Facebook. You can also use it for free, but — same as Fotor — there are ads you have to deal with. Ribbet is also a great tool you can use to replace PicMonkey. The tool can also be used for free without creating account, although you will be annoyed by ads if you work free account. It comes with a common interface with a panel on the left side. Ribbet has a bunch of tools to make basic adjustments and editing. There are also effects like sepia, vignette, black and white you can apply. Ribbet only allows you to open a photo from your computer, but you can re-upload the edited photo to Google Photos, Facebook and Flickr. Sure, it also allows you to download the edited photo to your computer. Photoshop, the Photographer’s favorite photo editing tool, also has an online version which you can use for free. You don’t need to to create any account to use it. It’s just, the free online version of Photoshop — which called Photoshop Express Editor — has a minimum features. However, it’s more than enough to replace PicMonkey. Even better than in some parts. You can use Photoshop Express Editor to adjust saturation, white balance, applying effects, cropping, resizing and so on. The photo you want to edit can be chosen from your computer. Pixlr is available in two versions: regular and Express. While the regular version of Pixlr tends to ideal to replace Photoshop due to its complex features, the Express version of Pixlr is great to replace PicMonkey. Pixlr Express has simpler features and easier to use than the regular version. You can also use it to apply some effects to your photos, as well as make adjustments like brightness, saturation, contrast and so on. 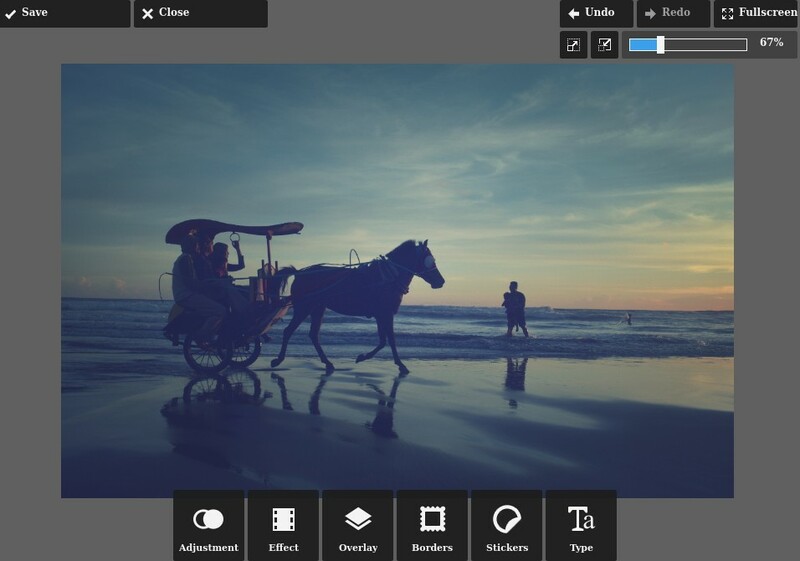 Pixlr Express can also be used for free without needing to create an account.